Knowledge plays a crucial part in our daily life and in every deeds. Knowledge helps us in making more money, take better decisions, and take care of ourselves and lead a qualitative life. It is a widely prevalent belief that after high school or college, your education is completed. But the truth is that learning and education are continuous and ongoing process throughout the life. Every day you learn something new. A successful person is always learning from his or her surroundings. The amount of knowledge to be learned in this world is unlimited. It would take a whole life to learn most of the things. He understood the importance of constantly gaining more knowledge. Material objects can be taken away from you, but knowledge cannot be taken away. A man may lose his fortune and all his earthly goods, but education would live with him forever. You can build your fortunes again with your knowledge, but no amount of money can substitute knowledge. The process of learning is never ending. You learn something new each day from every experience you have. To succeed in life, you should continuously make effort to gain more and more knowledge. Every day the world discovers something new. The amount of data available is inexhaustible. Knowledge would give you the best outcome if you can turn it into something productive or that is beneficial to all. You need to learn new ideas, thinking and concept through books, experiences, autobiographies continually, and other sources available. If you can spent time in acquiring knowledge now, it will pay much more compared to any material objects. Investing in education, be it your money, time, effort or a combination of all of them, will be repaid in direct proportions. The wiser you become, the better decisions you’ll make. Understanding the workings of the world or things has its advantages. It will help you become more successful in handling things. Improve yourself by learning about new things daily. How Can You Use Knowledge? Education is the most powerful tool that can change the way you look at the world. 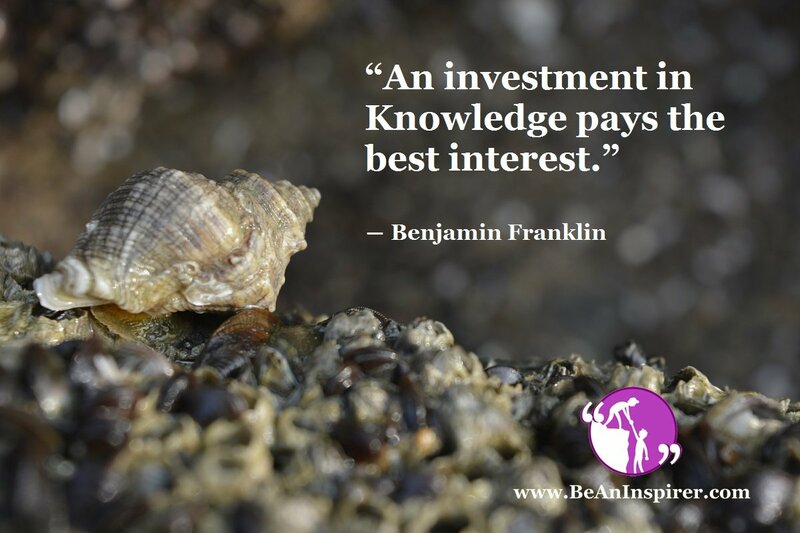 You can invest in knowledge within any area of your life. If you are young, you can invest in career skills that can help you in securing a job and becoming self-sufficient. A good college education may help you move ahead in life. It may assist you in earning more money and having more freedom. Knowledge can help you feel connected to the world and help you find a purpose in life. It can help you understand life better in general. Knowledge cannot be robbed. The economy may change and so does your personal situation. One thing that would always remain constant is your knowledge. By acquiring knowledge, we do not mean hoarding knowledge. Use your knowledge to improve your situation. Most developing and developed countries invest ten to fourteen percent of their income in educating their population. Governments also understand the value of education. It helps people lead a richer and healthy life. Knowledge can help not only individuals but also the communities. Experience and knowledge can help you separate yourself from the pack. With knowledge, you can reach any heights you want. No peak is unconquerable when you apply your knowledge to achieve your goals. It can help you to challenge long held ideas and beliefs. You can use your knowledge to craft a unique path for your life. Knowledge is the only treasure in your life. It has the power to change your life. Expand your knowledge and wisdom everyday. With the internet, knowledge has become more accessible. Use it to your advantage. Within a few clicks, you can access a database held by generations. Keep your eyes open and be open to learning new things. Invest your time and money in learning new things. READ ALSO: Self-Education Vs Formal Education: Which Is Better?